College Success is a fully customizable Adaptive Learning Environment® and Adaptive Placement Platform™ that provides knowledge for appropriate course placement and supplemental resource decisions. This system is equipped with computer adaptive placement and linear diagnostic testing, which assesses the knowledge and skills of incoming college students, as well as exiting high school students, and supplies targeted feedback to address each student’s needs. With the data collected through College Success placement tests, administrators can properly place students in courses suited to their skill sets, resulting in higher retention rates. 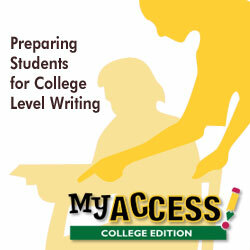 College Success allows you to individualize the placement test for each student through sophisticated, computer-adaptive branching algorithms and testing technology. By adapting specific test questions best suited for each particular test taker, you gain an accurate diagnosis of students’ knowledge and skills using fewer items than are typically required in traditional paper-and-pencil tests or even online linear tests. College Success provides 24/7 online testing capabilities to accommodate the needs of every testing center, and tests can be taken in a low-stakes (anytime, anywhere) or high-stakes (secure testing center) testing environment. By creating custom assessments through College Success, institutions gain the ability to create benchmarks and measure student outcomes. During a semester, students can receive diagnostic testing to ensure they are proficient in the skill sets learned. Then, at the end of the course, students can be tested again to ensure they are proficient in the material and can move on to the next level. This results in student success, ongoing proper course placement, and higher retention rates. College Success provides administrators with the ability to create a hierarchy of proctors, reporters, and test site managers with varying levels of access to assessments. Within the administrative controls, certain roles can define and adjust cut scores, create new tests online, design custom background questions, author new test items, review items, and deliver assessments. Administrators also have the means to create and adjust placement and diagnostic rules based on criteria defined by the administrator within the assessments. Alignment to either National Common Core Standards or the standards of your institution ensures your institutional objectives are consistently met. Through the assessments within College Success, each student’s unique strengths and weaknesses can be diagnosed and identified. Access to this information provides college and university personnel with the means to create individualized placement and remediation decisions that lead to higher participation and student success. Students receive customized and streamlined instruction and resources to help them adequately and appropriately prepare for achieving success in college. College personnel gain the ability to accurately place students in courses appropriate to their skill levels, enabling higher student retention rates. Faculty members can easily identify specific subject areas where students need help based on in-depth diagnostic feedback. Retaining students is crucial in boosting college completion rates and ensuring the growth and success of your institution. Through proper placement testing, students are placed in environments where their skills can be nurtured and mastered. to identify specific competency-level deficiencies, triggering individualized intervention. The College Success® program ties directly into adaptive learning pathways to begin the intervention process immediately. The Learning Pathways are activated for all competencies in which a student was unable to demonstrate proficiency. Each pathway contains (a) instruction, (b) practice, and (c) performance sessions, and cycle until performance meets the expected goal. Along with a set of standard reports such as score, placement, demographics, writing, testing statistics, etc., users can build custom reports to view the data that is deemed most important to them, their students, and their institution. All reports have drill-down capabilities to enable access to all information collected at a granular level. The robust reporting features of College Success allow administrators to run and build reports (rather than pre-canned reports), view accurate real-time information, and make informed decisions. *GMAC® and GMAT® are registered trademarks of the Graduate Management Admissions Council®, which was not involved in the production of, and does not endorse, this product.